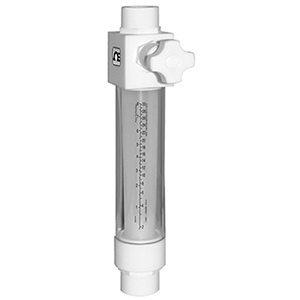 Made entirely of PTFE, PFA, and PCTFE, the Model FL-10 liquid flow meter is excellent for high-purity flow measurement applications or use with corrosive liquids. These flowmeters are available with a standard valve to monitor and control flow or without a valve to just monitor flow. Flow meters are individually tested on a Mass Spectrometer Leak Detector and certified to a leak integrity rating of 1 x 10-7 sccs Helium or better. Note: Comes complete with Leak Integrity Certificate. New meters have Direct Read Scale. No NIST calibration is available.